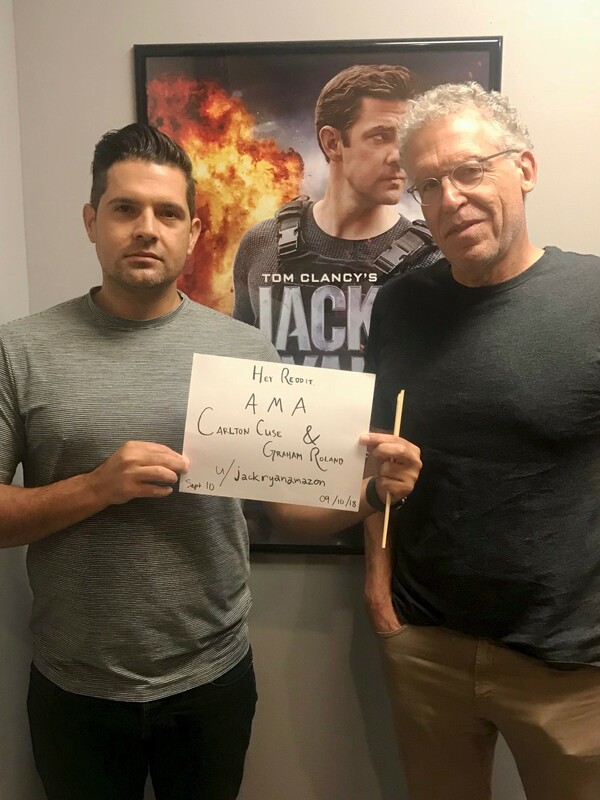 Hi, we’re creators and executive producers Carlton Cuse and Graham Roland, here to talk about our new show, "Tom Clancy's Jack Ryan", on Amazon Prime Video. Ask us anything! EDIT: Thanks for joining us, Reddit! Our AMA has now ended. You can stream Season 1 of Tom Clancy's Jack Ryan now on Amazon Prime Video. Jack's bike commute stirred up a lot controversy amongst DC locals. Did you intend for his commute to be realistic or just wanted to capture the feel of DC through that scene? authenticity was very important to us within the CIA, but we took a little license with his commute because we wanted to show off our nation's capital. What was the ultimate point of the UAV pilot storyline? I feel like it didn’t add anything to an otherwise great show. Great question! First off, we were very intrigued about having a mosaic of characters that intersected with the main narrative, and during our research we came across an article about drone pilots working and living outside of las vegas. We were really fascinated by the juxtaposition of those two worlds, and it led us to create the character of Victor. The point was to show a different perspective so that not all of our characters were operating with exact same level of commitment and patriotism; that there is a cost to doing this work that is not always the same for each person. How did you guys decide on John Krasinski? We were big fans of John from his work on the "office" and as we were getting ready to cast the show we were able to see a sneak preview of 13 hours, and we were very impressed by the transformation John went through physically and as a dramatic actor. We felt he had all the right attributes -- and there are a lot-- to be good in this role. When is season 2 coming?!?!! We are already 2 1/2 months into shooting it! Hopefully around this time next year, but that will be up to Amazon. I got amazon prime just to watch this, no chance season 2 is coming out sometime in the next couple weeks right? Just power watched the first season! Any hints on how important Russia is going to be in the next season? So in the past episode one of the terrorists(I don’t remember his name) bombs a pizza shop and as he’s walking out he passes a girl wearing a hijab. Later as he’s walking out of the hospital he looks down at a girl and almost looks guilty. I couldn’t tell but is it implied that the girl in the pizza shop and the girl at the hospital are the same person? Good catch. The girl Ibrahim shares a smile with in the pizza parlor with before he blows it up is the same girl he sees when he is fleeing the hospital. Are there plans to add John Clark? Or is Matice intended to be John Clark? Good question. Unfortunately, John Clark has his own book and is considered separate from the Jack Ryan franchise. paramount may develop a film or show around that character one day, but he will not appear in Jack Ryan. Matice is not just our version or J Clark. He is his own character that we are bringing back in season 2! What made you want to make this particular show happen and how did you decide on John K. as the lead? Thanks! We both really loved the original source material. I'd read like 8 books as a fan. Graham was in a Marines and was also a big fan of the books and moves -- as were a lot of people in the Marines. We thought it was the right time for a show that celebrated a classic hero, someone who was good at his job and we wanted to show that the military and intelligence communities were full of well meaning competent people who were working hard to keep us safe from the perils of the world. I appreciate all the little facts/trivia while watching the show. Who’s to thank for that? The whole writing staff. Jack Ryan's super power as a character is his brain and we wanted to show that he possesses a lot of arcane knowledge. We love that Dallas Keuchel came across his name while watching the show! Do you have a favorite moment or line from the show? GR: "Hey, did ya'll want a Fanta?" CC: Hitting SEND on the demarche and nothing dramatic happens. It's just a send button. In upcoming seasons, will there be more episodes than just 8? I hope so! The second season is also 8 eps. Why is there a lack of attention to detail when it comes to military uniforms? Seriously, sideburns in Marine Blues? I also noticed in Episode 3 (I think?) there was a security forces Airman with the most jacked up uniform I've ever seen. 1) Beret is not worn correctly. 2) No rank patch, which probably means he's an E-1? 3) However he has a 7-level occupation badge as an E-1? Only Staff-Sergeants (E-5) and above had reached that skill level in their respective jobs. 4) Combat Sleeves. This is a big no-no for deployed Airmen. Even those in the AF who have never deployed know this. Does your crew not have it in budget in to call up the closest military base and request a few officers to teach military dress and appearance? We try to get the details right. We were filming outside the US for a majority of the show. We had multiple crews and complicated logistics and some stuff slips between the cracks. Thanks for your observations. Love the series! What thoughts went into the adaptation of the characters from previous Ryan universe stuff? I like how the shows brings it all together at this point in his life and was curious how those discussions went? We tried to analyze what was essential to the Tom Clancy DNA. Here were a few things: obviously the central characters of Jack And Jim Greer; authenticity; a topical geopolitical storyline (which is why we didn't adapt any of the existing books); and the like of mosaic storytelling where you meet these new characters and are not sure how they are going to intersect with the main narrative. We took these "rules" and applied them to our own story. As someone who is currently enjoying the beginning of this series but having never read any of the novels, what were your main inspirations? Specific Tom Clancy novels/Games? Other series/novels/games? Also any recommendations on what Tom Clancy book(s) if I decided to jump into the novels? We both loved Hunt for Red October and Clear and Present Danger. Among the Clancy canon, the were our two favorites. In fact, we started out by trying to adapt CAPD, but it wasn't working. We felt like it was because the novel was written 30 plus years ago, and that we needed to come up with our own geopolitical story of the moment. We started writing this 3 1/2 years ago and at that moment in time we felt terrorism was the most existential crisis the world was facing. You mentioned you have already started filming season 2, so awesome!! Are you still casting any smaller roles like co-stars?? Possibly casting any real military/actors?? Season 2 has been shooting for more than a couple of months so we are pretty much fully cast. We have military advisers who are former servicemen -- and one has a part! Thanks for joining us, everyone! Our AMA has now ended. You can stream Season 1 of Tom Clancy's Jack Ryan now on Amazon Prime Video. Is there going to be a Jacob with this Jack? What was the biggest challenge you guys faced in developing and producing the series and how did you overcome them? Follow up question, if you were on set, do you have any funny stories? The scope of the show was really big for a TV show. We were filming in 6 different cities on 3 continents and we could not afford multiple trips. So we had to write all 8 episodes ahead of shooting and then cross-board them, so on any given day we might be shooting parts of any of the 8 episodes, which is challenging. A minor thing, but what was the rationale for changing Jack Ryan’s alma mater from the Naval Academy to BC? Why de-emphasize his his military backstory in this manner? What is your response to some viewers complaint that the show “humanizes terrorists”? I'm not them. But my opinion it's because they are in fact actual human beings, they are doing horrible things but they are still human. In this case if someone bombed your city and killed your family wouldn't you hate them too? As storytellers and fans of good stories, we both like movies and films with dimensional, complex "villains". One of the things we tried to do when discussing Suleiman's storyline in the writers' room was craft the antagonist story as if he was the hero, because in Suleiman's mind, he IS the hero. And in any story your hero is only as good as his antagonist. Also, we have seen the portrayal of the Middle Eastern extremist as a simplisitc bad guy bent on killing and destroying the west. We wanted to paint a portrait of a bad guy that was hopefully more dimensional. CC: The filmmakers of the movie "Airplane" came to my college to screen a rough cut of the movie. I thought the movie was awesome and asked them how to get into hollywood. They said "make a movie", so I made a documentary about rowing and took that as my calling card to LA where I got a job as the assistant to the head of a studio, driving him around, running his errands, getting papayas for his fruit shakes, buying dog food, xeroxing scripts, stuff like that and slowly worked my way up! Why Amazon Prime and not Netflix? Because Amazon is awesome first and foremost. Secondly, because Amazon started out as a book seller, and this is such an iconic book franchise it seemed like the perfect fit. What’s your go-to for lunch when it’s an hour past normal lunchtime? CC: Tacos! We are officed in the San Fernando Valley and there are a lot of good taco places. Good writing fuel. GR: If I miss lunch, I'm going for coffee and sugar and then I pass out in my office. Every buyer for a show I suppose has pluses and minuses. We feel like Amazon Prime was almost all pluses. They've been incredibly supportive and gave us the time and resources to make the show big and cinematic and tell the story the way we wanted to tell it. I'm sorry you can't get Prime -- where do you live? They do stream in many, many countries, even places where they don't deliver.